After Arnold Schwarzenegger launched the music, the producer revealed that The Expendables star would be gracing the premiere show of I held in the US. After leaving everyone in awe with it’s fantastic teaser, Chiyaan Vikram‘s I had captured the imagination of the nation. Fans and critics alike awaited for I to hit the screens this Diwali with bated breath. But the news of the release being postponed to next month left fans disappointed. The latest we have heard that the film has been slated for November end release. The ace producer also revealed that he has planned two premiere’s for I at USA and Singapore respectively. “We are planning to have two premieres. One will be in Singapore and the other will be in the US. Sylvester Stallone has agreed to participate in the US premiere of the film,” added Aascar Ravichandran. 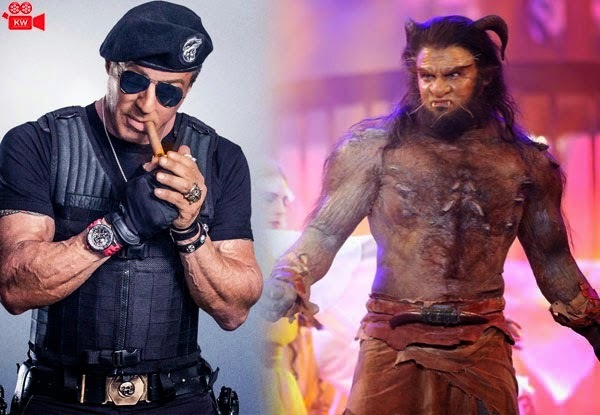 Roping in Arnold Schwarzenegger to come to India for audio launch and now bringing Sylvester Stallone to attend the premiere show, the filmmaker is leaving no stone untunred to promote I on a global scale. The Vikram starrer has generated huge hype worldwide following the successful audio and teaser launch event. "Terminator" actor Arnold Schwarzenegger was present for the audio launch along with superstar Rajinikanth and Kannada actor Puneeth Rajkumar in a grand event held in Chennai last month. The teaser received humongous response from the fans and fetched more than 7 million hits on the video sharing site YouTube. The film's songs, composed by AR Rahman, have also topped the charts. The success of the teaser and the songs has created a lot of positive buzz surrounding the project. Expectations are sky high for the big budget entertainer as Vikram and Shankar have teamed up for the second time post the success of their 2006-release "Anniyan." The film is touted to be romantic thriller with Vikram and Amy Jackson in lead roles.